Do we need to call the unions already? Not really, it’s just that more of us are working. Three structural changes contribute to this chart: longer careers (h/t Argyrios), higher capital intensity per worker, a labour intensive recovery. Subdued investment after 2008 decreased the capital intensity of output. Firms opted to replace capital with labour yet non-discretionary spending kept people in the workforce while nudging lower the inactivity rate. As labour supply increased, so did the number of firms as it happened between 2003 and 2007. 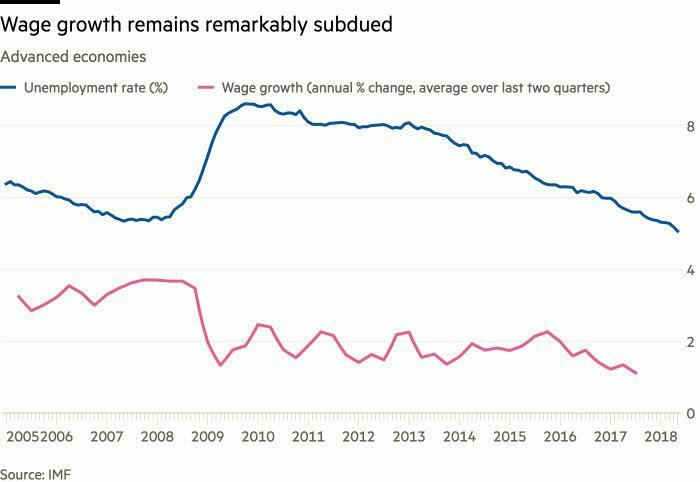 During those years, wage growth was also subdued until the indexed ratio of vacancies to the inactivity rate reached a trough. At this level, the ratio suggests market clearance in that there could be full employment and the economy can no longer increase labour supply. Above this level, the pace of wage gains is expected to increase in the following quarters. In 2004 there was a four quarter lag to wage increases while in 2009 it took 12 quarters. To understand the gap, it is relevant to consider new business listings. Entrepreneurs reacted to the favourable shock in labour supply by filling in vacancies while cutting wages. 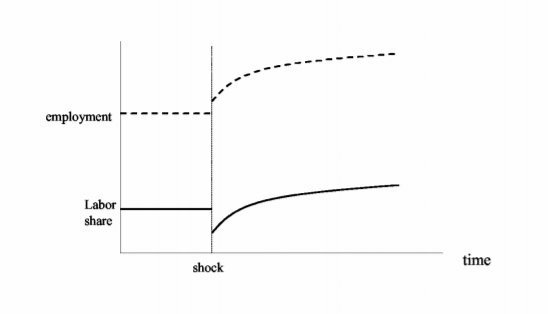 As presented by Acemoglu, wages eventually increase as capital intensity returns to the steady state. Following Acemoglu, the favourable supply shock to labour pushes firms to invest in capital-augmenting technologies, its most costly input factor. Investment increased vigorously between 2009 and 2012, the same year when, as predicted by Acemoglu, firms were satisfied with capital cost efficiency and turned their attention to labour. The labour market has been tightening since. Next Article What do we know about jobs and wages and growth?